9 out of 10 people would rather ‘Text’ a business than call or email it. When you consider the benefits it’s pretty easy to understand why. Whether it’s ordering drinks at a busy bar, asking for extra set of towels at a hotel, picking up a car from the valet parking or reserve a haircut at a hair salon, texting is the simplest, fastest, and the most effective way to obtain services. We can activate the text channel of any local or toll free business telephone number in a matter of minutes. 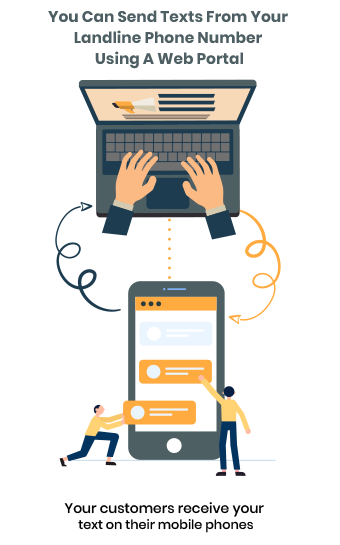 Once activated, texts to your business landline are received and displayed in a web portal equipped with modern messaging capabilities, text marketing campaigns, sales order generation, lead management, Facebook messenger integration, intelligent chatbots, online reviews, analytical tools and much more. Start your mobile and social messaging journey with Text Aspect and get two months free! Discover how texting can increase your productivity and enhance your communications. Send review links via text and messenger and track online reviews all in one portal. With over 90 percent read rate, texting is the most efficient method of contact to reach anyone in real-time and strike a conversation to provide marketing information, make announcements, send reminders and even sell products and services.